South Pickenham is a small parish some 5km southeast of Swaffham, in the Breckland Local Government District. The parish has an area of 744 hectares, and contains the small village of South Pickenham, and is just south of its larger neighbour North Pickenham. The parish is dominated by agricultural land, and as a result of this a number of prehistoric objects have been recovered from the fields in the parish. The earliest of these is a Mesolithic punch (NHER 13338), followed by a number of Neolithic axeheads (NHER 2687, 2699 and 2712), as well as a scraper (NHER 4647), and a possible discoidal polished knife (NHER 4646). Only one object from the Bronze Age has been recovered; an Early Bronze Age barbed and tanged flint arrowhead (NHER 2686). There have been no confirmed Iron Age objects, but a possible Iron Age or Roman sword guard has been recovered (NHER 32316). Certain Roman objects are limited to a fragment of an armlet (NHER 32316) and a coin of Marcus Aurelius (NHER 18626), however a possible Roman road is thought to run through the parish (NHER 8714). Although there is scarce evidence for Saxon period occupation, the meaning of the name ‘Pickenham’ is known to derive from the Old English of pica’s homestead, although analysis of the Domesday Book entry is complicated by the combination of South and North Pickenham into a single unit. However, a Late Saxon iron prick spur (NHER 4648) has been recovered from the parish, as well as an Early Saxon pottery sherd and a Late Saxon coin from the parish churchyard (NHER 4717). 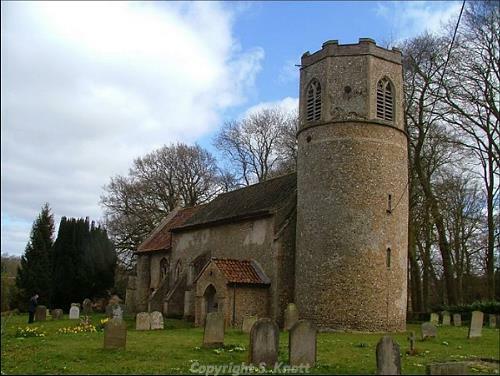 The church itself (NHER 4717) may date from the Late Saxon period, but the majority of the current building is thought to date to around 1300, with a 14th century crown to the earlier round tower. Inside, the Norman round arch, which retains some traces of its original painting, has been reduced, but a 14th century painting of St Christopher represents a surprisingly early survival. It is also thought that there may have been another church during the medieval period, dedicated to St Andrew (NHER 14899), but the exact location of this unknown. Although there is no evidence of a medieval manor in this parish, there are several ditched enclosures that indicate the presence of medieval crofts of enclosures (NHER 31639). However in 1993 large amounts of the village and surrounding farmland were still in the sole possession of the Pickenham Hall estate, which may be the remains of a medieval manor. Pickenham Hall itself (NHER 4710) is a large red brick house built at the turn of the 20th century, and is situated within Pickenham Park (NHER 30480). This landscape is known to have been a park since before 1797, and contains a particularly important Arts and Crafts period garden, laid out by R. W. Schultz, the architect of the Hall and the Keepers Lodge (NHER 46201). Also of interest is Home Farm (NHER 23017), a farmhouse of 1773 that contains an older house of around 1600, as well as the 17th century barn at Valley Farm (NHER 46516). World War Two also left its mark on the parish, which hosted a decoy airfield (NHER 13567) for RAF Marham until 1943, when the North Pickenham airfield was built. The decoy airfield was a type Q/K, and used tractors pulling Dummy Wellingtons to confuse enemy bombers.